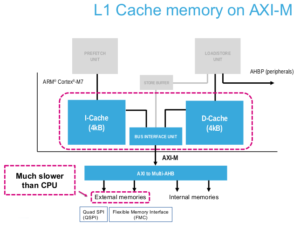 STM32F7xx is ARM® Cortex®-M7 processor brings high performance, Superscalar (2 instructions at 1 cycle), efficient digital signal processing to enable devices featuring superior embedded intelligence across the industrial, infrastructure and domestic sectors. 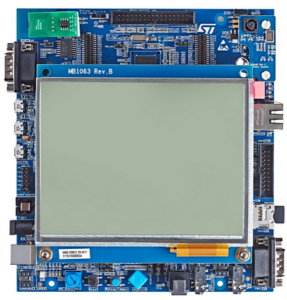 STM32F7 video presentation is here. 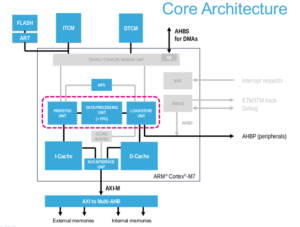 Thanks to their smart architecture with ST’s ART Accelerator™ and an L1 cache, STM32F7 MCUs deliver the full performance of the ARM® Cortex®-M7 core with code executed from either embedded Flash memory or an external memory, reaching 1082 CoreMark at 216 MHz. 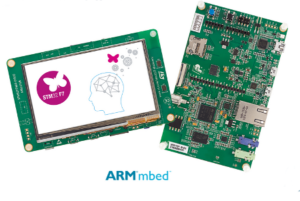 Two product lines with up to 1 Mbyte of Flash memory are available; the STM32F745 line and the STM32F746/756 line with TFT controller and hardware cryptography acceleration. 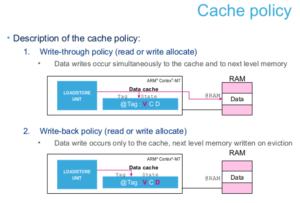 Packages range from 100 to 216 pins with sizes as small as 4.5 x 5.5 mm. 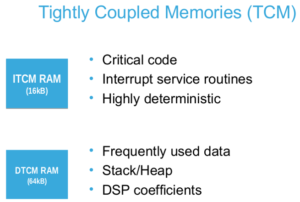 Optional instruction cache (4 to 64KB) and data cache (4 to 64KB), with optional ECC (Error Correction Code) support for each of the cache memories. 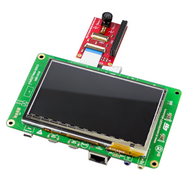 Based on STM32F746G-DISCO and TDnext CCD camera. 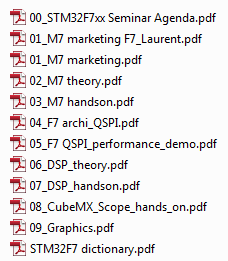 A complete list of the evaboards is here. 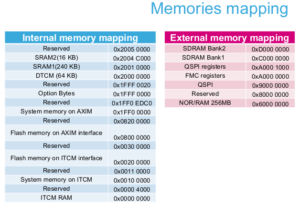 Some important tips concerning the STM32F7 (Cortex M7). 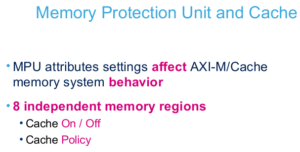 At the moment, the STM32F7-Training 06/2015 shall be issued only to SILICA customers. 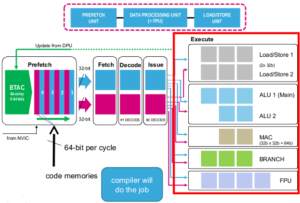 The instruction set of M7 are the same of M4 (see below), but a big difference is a High performance 6 stage pipeline with dual-issue (it executes up to two instructions per clock cycle). 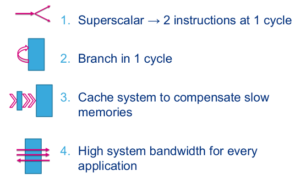 M7 is a superscalar MCU, this means that it has the possibility to execute two instruction every clock cycle. 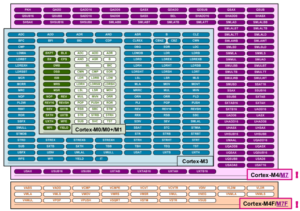 In other word means that Cortex M7 fetch from flash at 64bit. 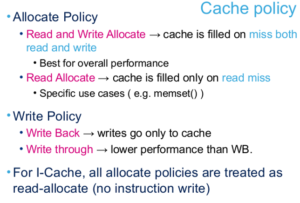 But for reach this performance is very important that the compiler is a clever compiler, this because M7 has the possibility to execute (in the same time) one of this instructions; see the red box below. 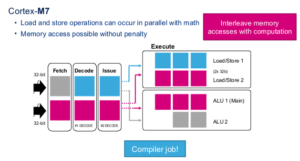 If the compiler write on two sequentially 32bit of flash, two load instructions, the M7 execute the first load and at the next clock cycle the second load… you have lost the possibility to execute two instruction every machine cycle. 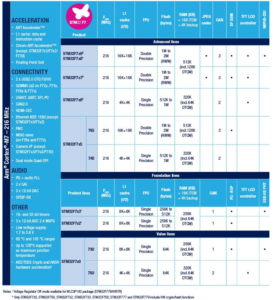 See the MPU instructions, in the Hands-On sections. 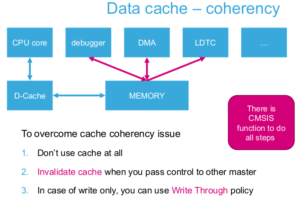 There are some examples concerning Cache, ITCM, DTCM, etc, in the Hands-On of this training.